Wear a part of a galaxy far, far away on your very wrist with our Star Wars bracelets. Shop here for Star Wars wristwear the whole family will enjoy. From womens Star Wars charm bracelets to Star Wars leather wristbands and Star Wars Rebels glow bracelets, we have it all. Check out Galactic Empire jewelry and Rebel wristbands perfect for showing your loyalty at any occasion. We carry Star Wars wristwear from the various eras of Star Wars, from pieces decorated with emblems from the classic Star Wars trilogy to The Force Awakens, The Last Jedi, and more. 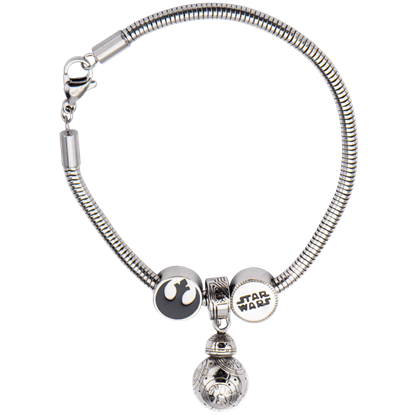 Shop Star Wars bangle bracelets, droid charm bracelets, Kylo Ren wristbands, and more in this category. Star Wars fans who admire the adorable astromech droid from Episode 7 will love this trendy jewelry piece. A 3D miniature of Poe Damerons companion dangles from the snake chain of the Force Awakens BB-8 Rebel Alliance Charm Bracelet. While the Galactic Empire surrendered to the New Republic, the surviving Imperials refused to forsake its ideals, vowing to restore its power. 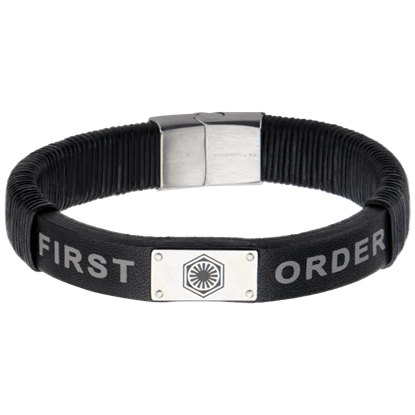 Their insignia appears on the trendy Force Awakens First Order Black Leather Bracelet. After the fall of the Galactic Empire, a military faction forms with the goal to restore it. Through careful mechanizations, their power grows. Show support for their cause with the Force Awakens First Order Logo Leather Bracelet. 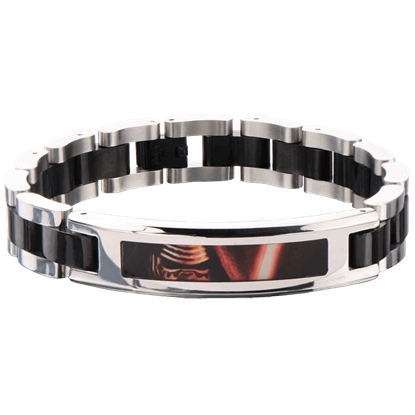 Celebrate the continuance of the Star Wars saga with the Force Awakens Kylo Ren Black Link Bracelet. Inspired by the legends of his grandfather, Darth Vader, this Dark Jedi seeks to complete what the Sith Lord left unfinished. A quest to discover the location of Luke Skywalker led to her transformation from scavenger to Jedi prodigy. The Force Awakens Lead Hero Rey Stretchable Bracelet features imagery from the seventh episode of the Star Wars saga. Honor the valor and courage of the X-wing Starfighter team, Red Squadron, by wearing this wristband. 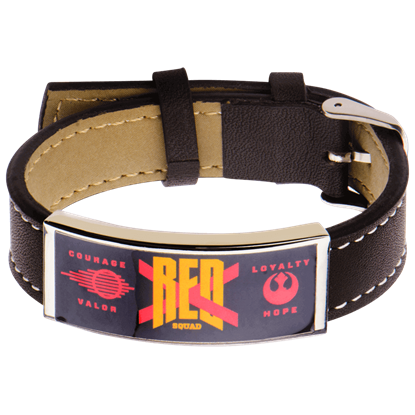 Imagery that celebrates their loyalty to the Rebellion decorates the ID Plate of the Force Awakens Red X Brown Leather Bracelet. For fans aligned with the dark side, we offer this trendy piece. Surely, there is nothing wrong with bringing a little order to the universe. 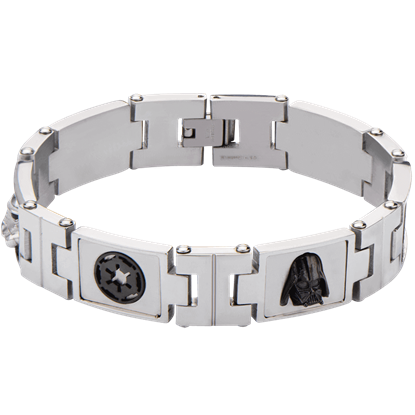 Show appreciation for the New Order with the Mens Star Wars Galactic Empire Link Bracelet. 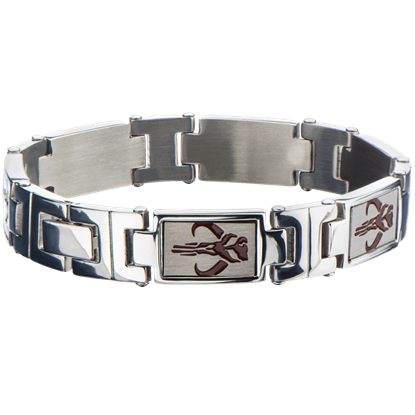 Much debate surrounds the image displayed on the Mens Star Wars Mandalorian Symbol Link Bracelet. Some say the Krybes represents the skull of either a Bantha or Mythosaur, while others believe it honors an ancient training master. 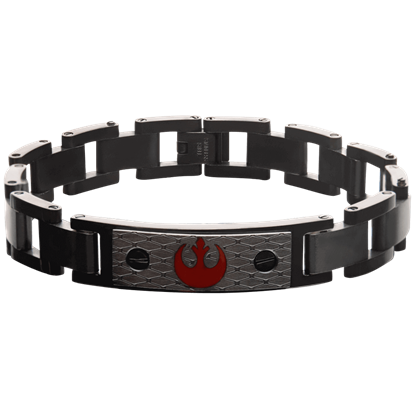 Reveal your loyalty to the Resistance and add the Rebel Alliance Black ID Plate Link Bracelet to your jewelry collection. Combine your sense of style with a love for the epic space opera by adorning your wrist with this trendy piece. The Star Wars universe is full of unforgettable characters, whether they align themselves with the Galactic Empire or fight for the sake of the Republic. 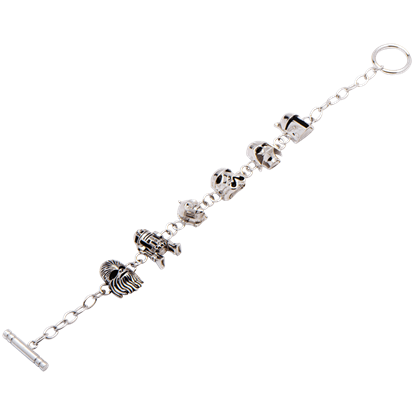 Collect all your favorites with the Star Wars 3D Characters Charm Bracelet. The clash between the Rebellion and the Galactic Empire is the stuff of legends. Both factions possess unforgettable characters, making it difficult to choose sides. 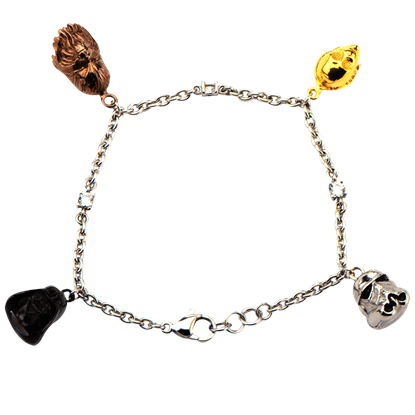 Honor both with the Star Wars 3D Characters Gemmed Charm Bracelet. 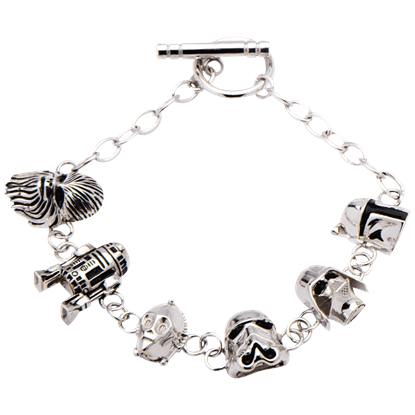 Celebrate the fortieth anniversary of the epic George Lucas series with the Star Wars 3D Characters Sterling Silver Charm Bracelet. With the original trilogy, Lucas introduced us to a distant galaxy full of intriguing characters.